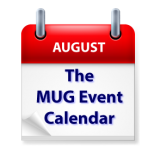 The MUG Event Calendar for the Week of August 21: Rob Pegoraro, ChronoSync, Photos, and Girls Rule! This week’s MUG Event Calendar features an appearance by journalist Rob Pegoraro at a Virginia group, a discussion of syncing with ChronoSync at a California group, a focus on Apple’s Photos in Michigan, and the topic, “Girls Rule!” will be at the top of the agenda at an Australian group. Also Larry Jordan returns with a bunch of 3rd party plug-ins for FCPX you need to have and need to see. South Jersey Apple User Group – Operating Systems: Are There Differences? Should I Upgrade?